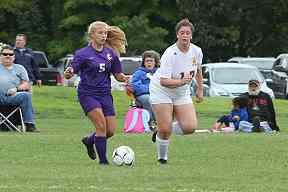 Chateaugay’s Grace Locklin (1) chests down the ball with Colton-Pierrepont’s Matty Lovely battling behind her. 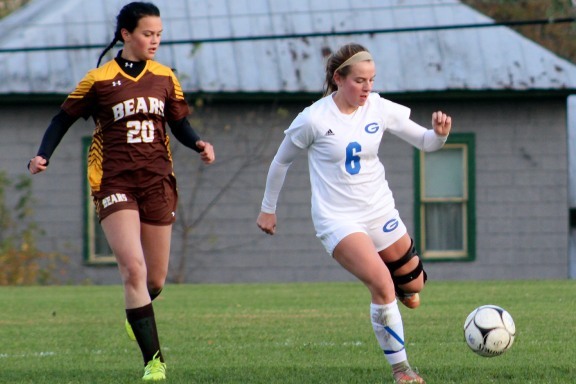 The Bulldogs' Jenny Jones scored on a penalty kick in the 16th minute for the lone goal of the game, as Chateaugay defeated Colton-Pierrepont in a tight 1-0 win. 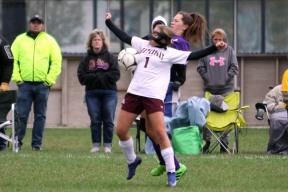 (Zachary Matthie photo) Game Gallery Colton-Pierrepont’s Jaeleigh Jacot (19) heads the ball near midfield, as as Chateaugay’s Jennifer Jones (7) closes in to defend. Jones scored the game's lone goal, while Bulldog keeper Hanna Colk collected 10 saves for the shutout. Colts' keeper Kaiti Long made 11 stops. Malone’s Ellie Gravell (6) traps the ball with her knees as Canton’s Nika Husinec (9) and Emma Kerrigan (16) surround her to fight for possession. 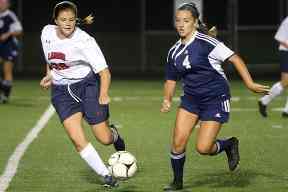 Canton and Malone battled to a scoreless tie in the first half. 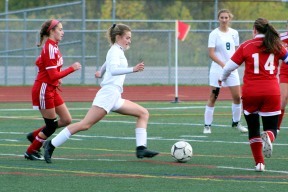 Gravel scored the game's only goal at 7:09 of the second half, as Malone survived Canton 1-0. 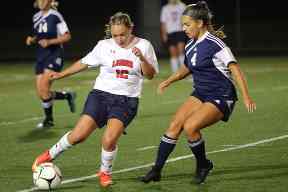 (Zachary Matthie photo) Game Gallery Canton’s Jennifer Haycook (22) chests the ball down as Malone’s Allie Lewis (14) looks on from behind. 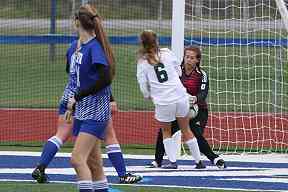 Both goalkeepers - Canton's Abby Dent and Malone's Abby Lamica each collected nine saves between the pipes. 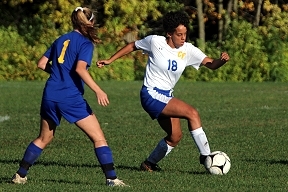 Gouverneur’s Riley Storrin (6) dribbles the ball mid-field with Canton’s Nakita Duvall (20) playing tight defense. Storrin scores two goals in the second half of the game both goals were unassisted as Storrin scores the only goals of the game for either team. Gouvereur’s goaltender Leeann Barbarito ends the game with 7 saves to shutout Canton. Gouverneur defeats Canton 2-0 in a hard fought contest. 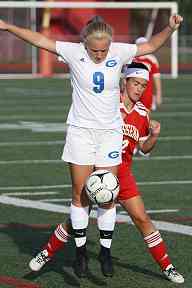 (Zachary Matthie photo) Game Gallery Gouverneur’s Hannah Spilman (10) traps the ball mid-field behind Canton’s Morgan Whitman (12). Norwood-Norfolk’s Courtney Delosh (1) turns the ball upfield early in the first half . 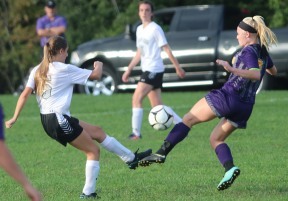 After a back-and-forth first 25 minutes, the Panthers broke through win a goal by Hannah Zenger, her first of three scores, assisted by Erica Sloan. 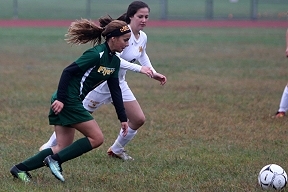 Sloan scored three times, while Kaitlyn Kirk scored twice and Emily Collins contributed a goal. Breanna Woods turned away five Flyers' shots, mostly at the start of the game. 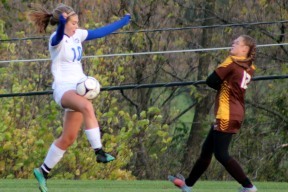 Norwood-Norfolk’s Macey Ward (10) kicks the ball past Tupper Lake goalkeeper Cierra Toohey for a Flyers' score. 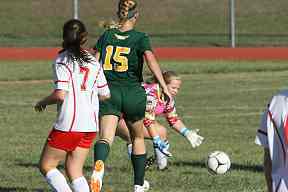 Norwood-Norfolk goalie Alaina Elliot needed to make just one save, while the Flyer defense dominated in a 3-0 East Division win. 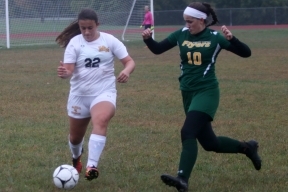 Ward, Courtney Delosh and Emma Schiavone each scored a goal in the Flyers' win. 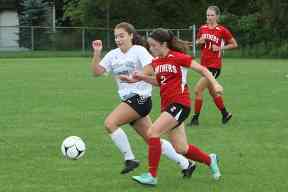 (Zachary Matthie photo) Game Gallery A Tupper Lake’ defender toes the ball for control at midfield in front of Norwood-Norfolk’s Emma Schiavone. 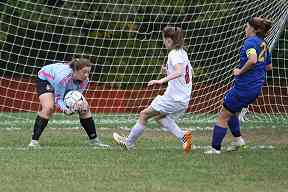 Tupper Lake goalkeeper Cierra Toohey ended the game with five saves. Heuvelton’s Trista Ashley (10) slams the ball through two Edwards-Knox players Hailey Matthews (11) and Kanika Johnson (1). 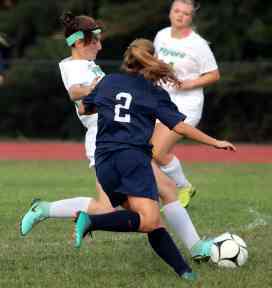 Koryn Rowe scores twice, Abigail Hart scored one and assisted on another, and Lucy Frary netted a goal. 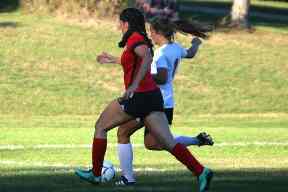 Edwards-Knox scored four unanswered goals in the second half to defeat Heuvelton 4-0 in West Division play. (Zachary Matthie photo) Game Gallery Edwards-Knox's Kanika Johnson (1) steps in front of Heuvelton’s Chloe Combs (5) to stop the ball from advancing. The Edwards-Knox win knocked Heuvelton from the tie with Lisbon atop the division. Norwood-Norfolk’s Courtney Delosh (1) works hard to keep the ball away from the net in the second half. 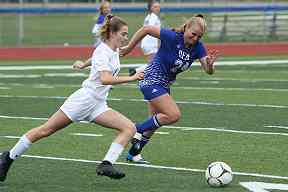 Ogdensburg midfielder Jaylene Dawley (24) and Malone forward Ryleigh McCauley (8) battle for possession of the ball off the Huskies throw in. Grace Bilow and Caitlin Douglas scored the Malone goals in the win. Victoria Hanna turned aside six OFA shots. LaFlair made 11 saves. 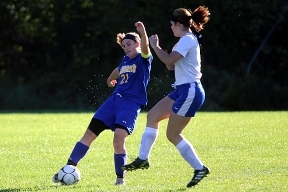 Hermon-DeKalb's Kari Hance (2) battles the ball away from a Harrisville forward at midfield. Makenna Smith scored a goal in each half, wrapped around the middle score on a direct kick from Audri Tahonica. Mattie Brabaw dished out an assist. 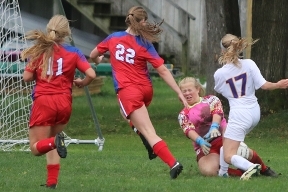 Massena goalkeeper Sabella Cromie (0) makes a diving save behind her to keep Malone’s Ellie Gravell (6) from scoring. 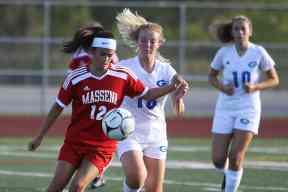 Massena’s Novaleigh LeGrow scored both Raider goals, assisted by Kylie Letham and Ariana Noriega. 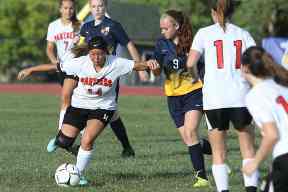 Malone’s Abby Lamica and Ryleigh McCauley each scored a goal. Massena and Malone ended a hard fought game with a 2-2 overtime tie. (Zachary Matthie photo) Game Gallery Malone’s Abby Lamica (1) slams the ball past Massena’s Julia Blair (14) to tie the game late in the second half. Madrid-Waddington netminder Morgan Burns (30) catches the ball in front of Colton-Pierrepont attacker Kaitlyn Johnson (13). 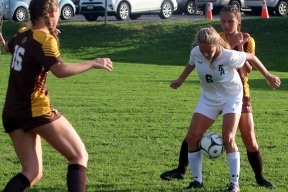 Jaelynn Uppstrom and Camryn Chester each scored a goal, while Emma Plumley assisted on both scores for the Yellow Jackets. 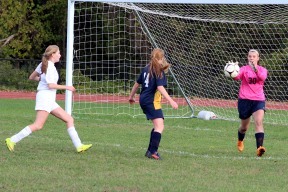 Burns shut down Colton-Pierrepont with five saves to give Madrid-Waddington a 2-0 victory. 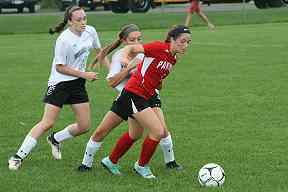 (Zachary Matthie photo) Game Gallery Madrid-Waddington’s Phoebe Zagrobelny (5) seals off Colton-Pierrepont’s Alayna Rutledge (17) to retain possession. Clifton-Fine’s Chandra Crane (18) turns the ball away from danger in front of the net early in the first half. 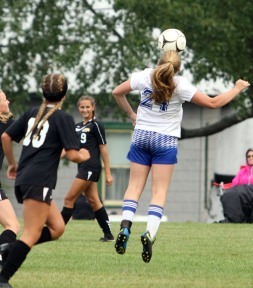 Erika Snyder opened Lisbon's scoring just 2:04 into the contest, set up by Kallie Wood. 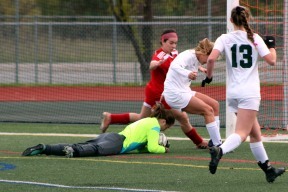 Abby Flack tipped a shot off the Eagle goalie's hands for the second score. 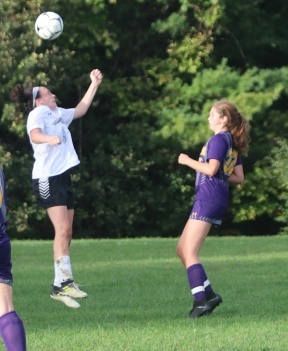 Makayla Hyde's header inside the right post rounded out the first-half scoring. Hyde added an insurance marker in the 50th minute. 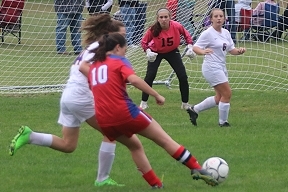 Makenna Hitchman scored the Eagles' lone goal just three minutes later. 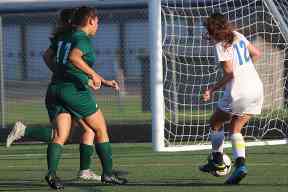 Both goalies, Lisbon's Hope Walker and C-F's Alicia Mathews, turned aside eight shots each. 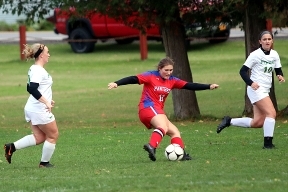 Canton’s Abbigail Dent (1) smothers the ball in front of Massena’s Kylie Letham (12) and Elizabeth Rogers (15). Canton’s Hannah Stevenson scored the Bear’s first goal four minutes into the first half, assisted from Catherine Chisholm. 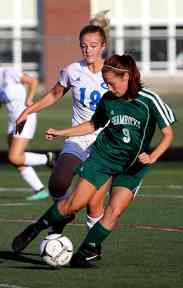 Hannah Reed and Jennifer Haycook each scored a goal for Canton. 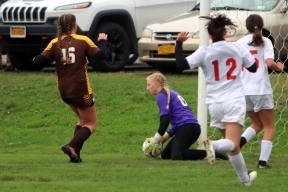 Dent makes five saves for the Golden Bears to help defeat Massena 3-0. 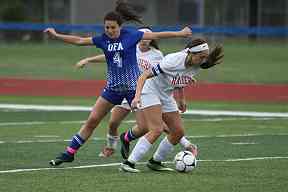 (Zachary Matthie photo) Game Gallery Canton’s Sarah Sieminski (2) traps the ball as Massena’s Ariana Noriega sets up for defense. Canton improved to 5-2-2 Central, 5-4-2 overall. Massena slid to 3-6, 4-7 overall. 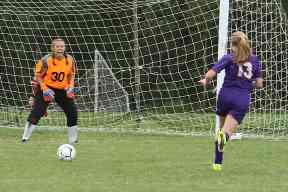 Colton-Pierrepont goaltender Kaiti Long (15) braces for a shot on goal from P-H's Filano between two defenders in Monday's game. Erica Sloan netted the game's first goal just 2:20 into the contest. Other goals: Zenger from Gray, Kirk from Sloan and Kirk from Phillips. 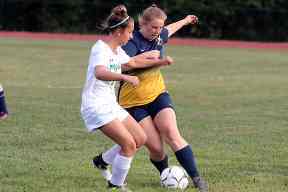 The Colts got the only two scores of the second half: Jaeleigh Jacot sent a ball on net that was booted by a Panther fullback, ricocheted off another defender and into the net for an own goal. Landree Chamberlain netted a goal. Woods had four saves. 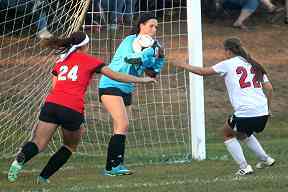 Hammond’s Brandy Milsap traps the ball in front of Tupper Lake’s goalie just before scoring Hammond’s fourth goal late in the second half. 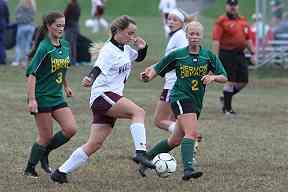 Kelsey Bennett scored two goals for Hammond as Brandy Milsap, Kylie Vaughan and Avery Kenyon added one each. Madeline Rathbun finishes the game with 13 saves for Hammond as they commanded the game in a 5-0 win. (Zachary Matthie photo) Game Gallery A Tupper Lake defensive player heads the ball out of the air in front of Hammond’s Avery Kenyon (11) to keep the ball from entering their zone. 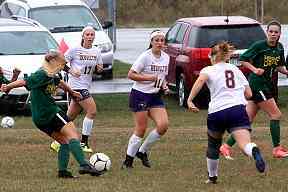 Canton’s Hannah Reed (6) slammed the ball past Ogdensburg goalie Sierra LaFlair for the score, staking Canton to a 1-0 lead early in the 10th minute of the second half. Jennifer Haycook, who assisted on the first Canton goal, scored the Bears' insurance goal in the 72nd minute. Canton shut out the Blue Devils 2-0. (Zachary Matthie photo) Game Gallery Ogdensburg’s Jaylene Dawley (24) heads down and traps the ball in front of Canton’s Dawley Carly Mattice (13) for control. 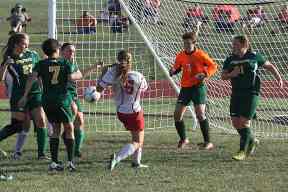 Canton keeper Abbigail Dent stopped four shots, while O.F.A. 's Siarra LaFlair stopped 13 shots on net. Madrid-Waddington defender Cree Cordwell (9) battles the ball away from Chateuagay's Chloe Champagne (3) to regain possession for the Yellowjackets midway through the first half. After playing to a scoreless tie through regulation, both teams scored in the first of two overtimes. Hosmer scored from Meredith White for the Jackets. 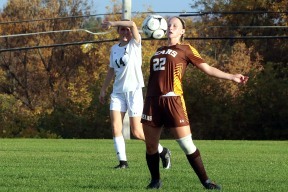 Kylee Peterson tallied the goal for Chateaugay. 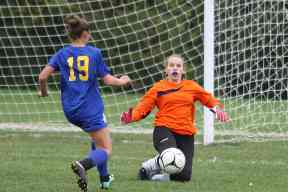 The keepers, M-W's Morgan Burns and Chateaugay's Hannah Cook had 12 saves each. 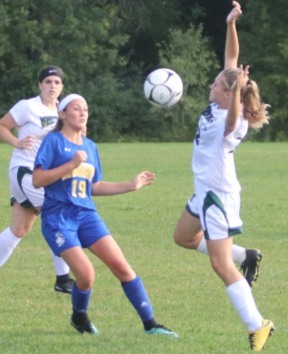 Gouverneur’s Elly Gamble (9) leaps and blocks the ball away from Massena forward Kylie Letham (12) to hold possession. Riley Storrin drove home both goals for the Wildcats. Ireland and Laney Smith assisted each marker. Abby Ruitta collected 10 saves in the shutout. For Massena, Stella Cromie turned away 13 shots between the pipes. Hammond keeper Madeline Rathbun slides onto the ball blocking the close-range shot from Lisbon’s Makayla Hyde (19) in the closing minutes of the first half. Lisbon’s Emily Jordan tied the contest on a penalty kick in the 46th minute, early in the second half. Jordan set up the game winner on a feed to Alexa McKee in the 61st minute. Lisbon goalie Hope Walker collected eight saves in the win. 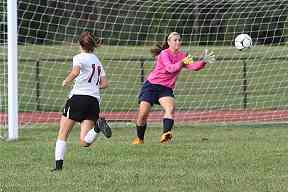 Hammond keeper Madeline Rathbun turned aside six shots. Ogdensburg forward Shelby Ross (4) battles with a Massena midfielder over possession of the ball off the Red Raiders throw-in. The Red Raiders netted their first goal from Kourtney Peets to Novaleigh LeGrow in the 17th minute. 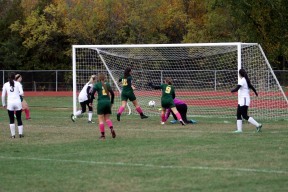 Margarent Wilmshurst assisted on the second goal to Megan McGowan in the final minute of the first half. LeGrow dished out her second assist to Ava LaValley who scored the game-winning goal with 12:38 remaining. Goalie Isabella Cromie collected eight saves between the pipes. 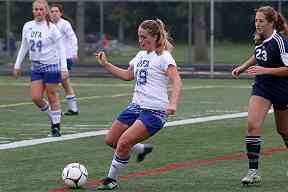 Ogdensburg’s Elizabeth Peo (19) turns the ball up the field in an offensive surge late in the second half. Both teams missed chances to connect with the overtime winner, but perhaps the closed chance came with under two minutes left in the second overtime when a Potsdam clearing attempt ricochetrf off O.F.A. 's Natalie McCormick. Potsdam keeper Taylor Benda grabbed the ball behind her, but the officials ruled that says the ball did not fully cross the goal line. Hermon-DeKalb’s Kari Hance puts on the defensive pressure to stop a wave of Bulldogs on the attack. 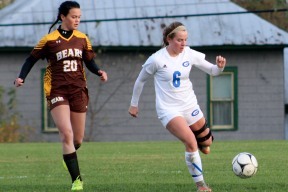 Dakota Mouthrop scored two goals and assisted on a third score in leading the Bulldogs to the win. Madison McCormick added a goal and two helpers. 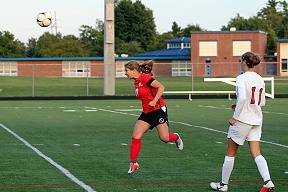 Molly Williams also scored a goal. Emma Lafaver had a four-save shutout. Heuvelton outshot the Demons 21-6. 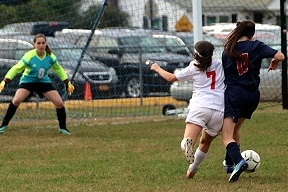 St. Lawrence Central's Marissa McLean (11) battles hip-to-hip with Massena's Ariana Noriega (7) as she closes in on goal. The Larries' lone goal was scored by Mackenzie Moreau. 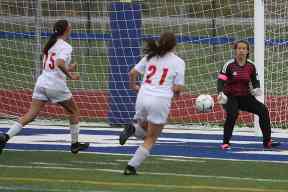 Larries' keeper Brooke Rubado turned aside 13 shots. 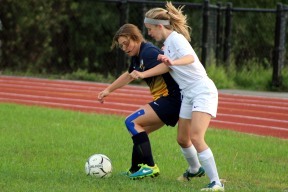 Edwards-Knox's Lucy Frary (9) heads the ball in an attempt to move the ball out of the Cougars' zone. 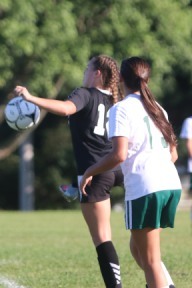 E-K netted the game's first goal on an own goal in the third minute of the game and carried a 1-0 lead into the half. Heuvelton's Madison McCormick tied the game on a setup from Molly Williams in the 48th minute. 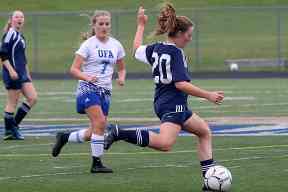 With 15 minutes left, Heuvelton's Cyera McNamera lofted a direct kick that rolled off the fingertips E-K goalie Mikayla Meilleur and just crossed the line for what would prove to be the game-winning goal. 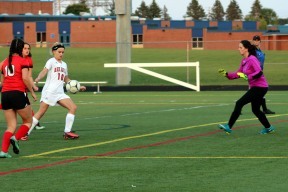 Emma Lafaver stopped six shots for the Bulldogs. 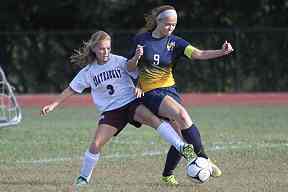 Lisbon’s Emily Jordan (1) fights for control of the ball with Morristown’s Nicole Whitmarsh (2) from behind late in the first half. Jordan assisted on the game’s lone goal. Lisbon’s Hope Walker collected six saves in the shutout. 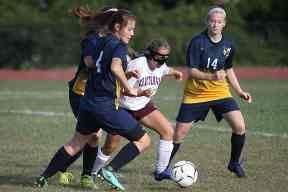 Lauren Woodcock stopped eight shots for Morristown. 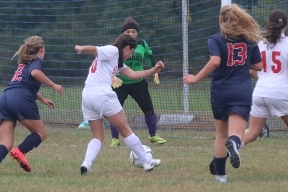 Jacks goalie Ava Cuttaia (2) grabs the shot from Brushton-Moira’s Abby Trim to keep the game close at 1-0 in the second half of a competitive game at Tupper Lake. Canton’s Morgan Whitman (12) jumps in front of Salmon River’s Jadie Burns (13) to gain possession of the ball for the Bears. Abby Dent collected six saves in the shutout. Madrid-Waddington goalie Morgan Burns (30) makes the catch to stop the shot from Brushton-Moira forward Abby Trimm (11) midway through the second half to hold the 2-1 lead. Madrid-Waddington goals were scored by Emma Plumley from Sydney Hosmer and Cassidy Hargrave, and Stephanie Curran from Plumley. B-M scoring information was not yet available. 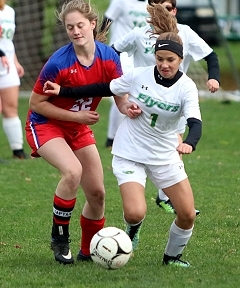 Edwards-Knox midfielder Camryn Bullock (13) battles for possession of the ball at midfield with Brushton-Moira forward Megan Ashley (2) in the first half. Koryn Rowe's initial shot banged off a BM defender for a 1-0 lead. Dekoda Matthews scored four minutes into the second half to make it 2-0. Teaghan Phelan scored both Panther goals to tie the game. Both teams had 14 shots on goal in the contest. Potsdam’s Katharine Cowan (4) chases the ball downfield in a surge of Potsdam offense. Cowan tied the game 1-1 early in the second half. But Lemieux netted the game-winning goal with just 38 seconds left in the 2-1 win. Brooke Rubado stopped eight shots for the Larries, while Taylor Benda also stopped eight shots for Potsdam. Norwood-Norfolk’s Alyssia Simons (11) direct the ball toward the goal, but it misses just left. 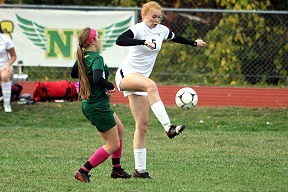 Norwood-Norfolk’s solo goal was scored on a direct kick form Courtney Delosh. M-W's Morgan Burns collected four saves in the net, while N-N's Taylor Allen posted a 12-save performance. Parishville-Hopkinton goalkeeper Bailie Woods grabs the ball on a shot from Norwood-Norfolk forward Shaylynn St. Andrews (15) to keep the Flyers scoreless in the second half. Both goalies, including Norwood-Norfolk's Taylor Allen, each posted six saves in the contest. 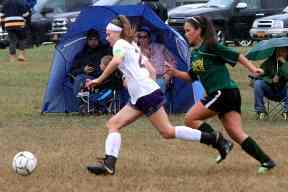 Colton-Pierrepont’s Natalie Cowen (5) battles her way around St. Regis Falls defender Bridgette Martin (17) and charges toward the Saints' goal, in the semifinals of the Colts' tournament. The Colts' Natalie Cowen and Abeni Payne scored twice a minute apart in the second half to erase a 2-1 halftime deficit in the win. Reina Boyea and Skyelin Bradford tallied for the Saints. 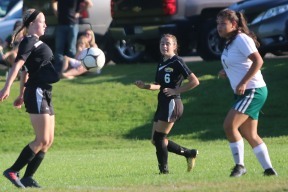 Salmon River’s Rylee Garrow (9) plays keep away from Gouverneur's Ireland Martin (18). Martin scored the Wildcats' line goal of the second half. 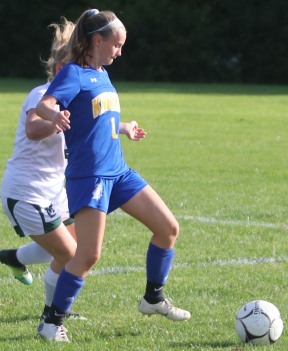 Carlee Lumley redirected a shot off a Salmon River defender that proved to be an own goal. Abby Riutta stopped four shots in the shutout. Logan Lazora made 13 stops for Salmon River.